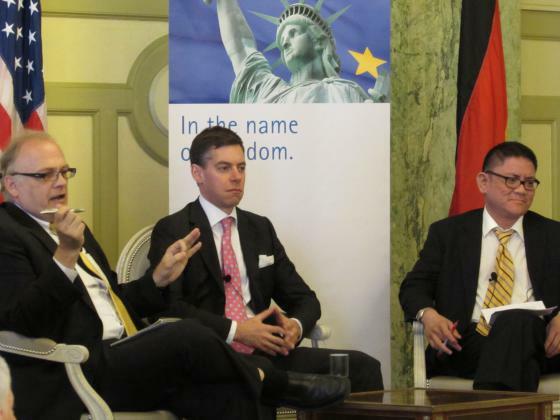 The Friedrich Naumann Foundation invited US-American Campaign experts and Journalists to visit Germany during the ‘hot’ campaign phase of the German Federal Election. 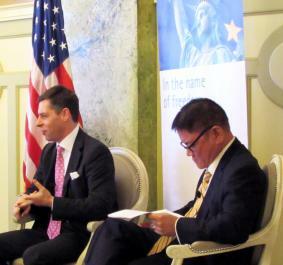 The American visitors had the opportunity to meet parliamentary candidates, campaign experts, and political professionals. Stations of the journey where the cities Frankfurt, Mainz, Wiesbaden and the German capital Berlin, where the participants visited rallies and spoke to representatives from across the political spectrum. 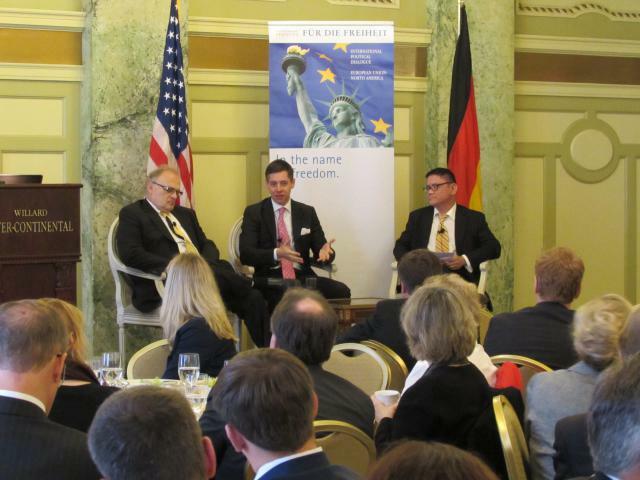 Jacob Heilbrunn, Editor of ‘The National Interest’ and Vic Matus, Senior Editor of ‘The Weekly Standard’ where part of this trip and shared their observation of the election campaign one month after the elections took place, with the guests of the Friedrich Naumann Foundation. Claus Gramckow, Representative USA and Canada, FNF opened the discussion on Germany’s recent federal elections with a short introductory overview of the vote. Angela Merkel succeeded overwhelmingl y and stays German Chancellor. Much less favorable where the results of the liberal Free Democratic Party (FDP). The FDP only gained 4.8% of the votes in the election – only a small 0.2% shy from achieving representation in the Bundestag. Providing a general overview of the election results, Gramckow also presented possible coalition combinations and indicated that the “Grand Coalition” of the CDU/CSU and SPD will most likely lead the Bundestag for the next four years. The gains of the Grand Coalition came in part from the FDP’s loss, as many voters shifted to the CDU. Heilbrunn started his statements cautioning that the FDP should not yet be discounted as the party still has representation within state governments. Nevertheless, the loss of the FDP within the federal elections should be taken seriously as the FDP lost ground both internally and externally. The extremely successful CDU campaign meant that smaller parties on the German ballot simply had difficulty competing. The “mother knows best” campaign under Merkel presented a political party that sought to maintain economic stability. In addition to facing such daunting competition, the FDP found itself with much internal strife. A lack of a clear campaign message also turned voters away. Matus echoed much of Heilbrunn’s remarks and added some perspective on the other parties that lost in 2013. Smaller parties isolated many voters with outlandish proposals like the Green Party’s “meatless Thursday” proposal, which drew voters even closer to the CDU’s more moderate campaign. A combination of CDU strength and smaller party misguidance led to such a strong victory for the CDU.